Planting a bean in cotton wool turns gardening into a simple science project to share with children. To add an extra bit of knowledge to the experience, grow the bean in cotton wool in a clear container or a zippered plastic storage bag so everyone can watch the roots and sprout develop. Cotton wool is raw and unprocessed, unlike the typical puff balls in a medicine cabinet. Clean and sterilize the container if you have used it before. Line the bottom of the container with cotton wool. If you are using a zippered bag, fill it about halfway with the cotton wool. Water the cotton thoroughly so it is completely saturated but not overly wet. You should not see dry cotton or standing water. Position the beans on the cotton wool. For the zippered bag, lay them between the cotton wool and one side of the bag before sealing the zipper. Place the container in a dry, cool place until the beans sprout and develop at least four leaves. 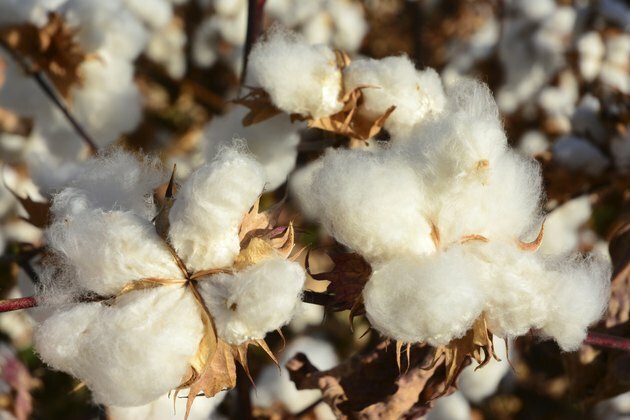 What Kind of Climate Does the Cotton Plant Require?